While I dread the end of the summer, there’s always a surprise in the garden in autumn. 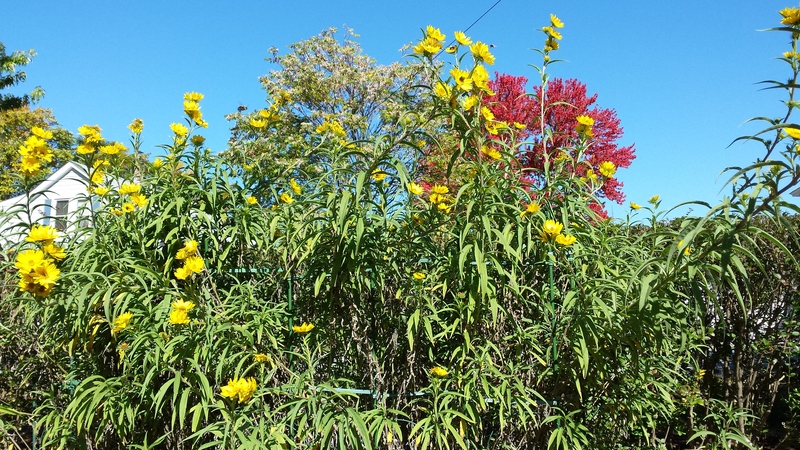 This year, the surprise was late – the Maximillian (or New Mexican) Sunflowers. These have been in the garden for over a decade, started from seed and over the years have been shared with friends across New England. As I write this, I’m reminded that a clump of them will be travelling this weekend to a special garden of an artist friend in Weare, NH. Not your typical sunflowers, these look ‘weedy’ all summer, until they start to bloom in late September. This year, the bloom didn’t start until mid October – just in time for the frost that is expected this weekend. There’s nothing more refreshing than a bright burst of yellow in the garden as everything else is ready to come to an end. Categories: Autumn | Tags: autumn, fall, Garden, maximillian sunflowers, NH, sunflowers | Permalink.